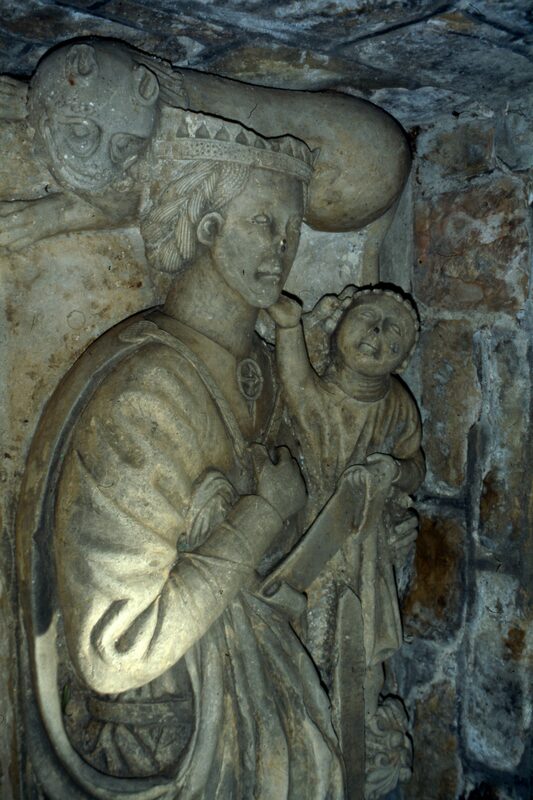 The monument of Lady Constantia and her infant son John in the Derbyshire village of Scarcliffe was conserved in 2007 with financial support from the Heritage Lottery Fund and the Council for the Care of Churches. Moved several times inside the church during its history, it is nowadays placed on a new stone plinth alongside the north wall of the nave. It was previously recorded by Charles Stothard and Richard Gough. Scarcliffe is proud of its monument, which is unusual but probably not quite what it seems. 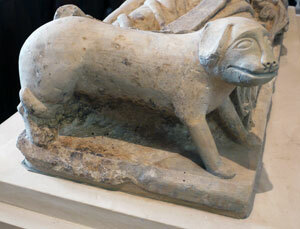 The magnesian limestone monument is curiously flat and archaic in style, but hard to date. 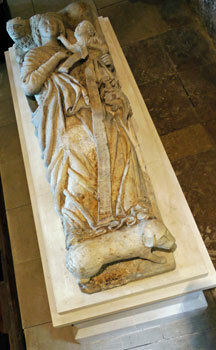 It shows a recumbent female effigy with an inexpressive face and plaited hair. 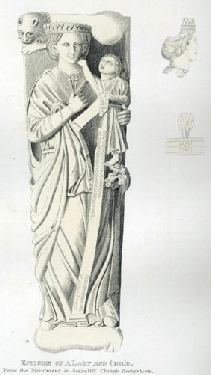 She wears a long gown and a cloak fastened with a decorated cord that she clasps in her right hand – a common motif on medieval figure sculpture. The drapery is rather clumsily executed. 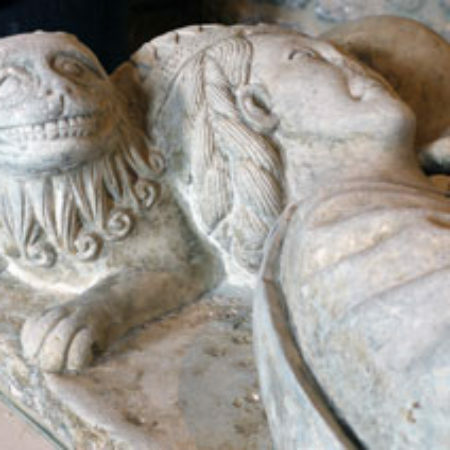 (Fig 3) A grinning lion supports her crowned head (Fig 4) while her feet rest on what appears to be a crouching dog. (Fig 5) The latter’s head and right front leg are timber replacements of a later date. The effigy is broken across the lower legs. 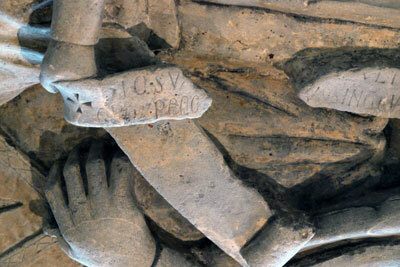 Apart from the names Constantia and John, the text mentions no family name or patronym nor even a date of death. 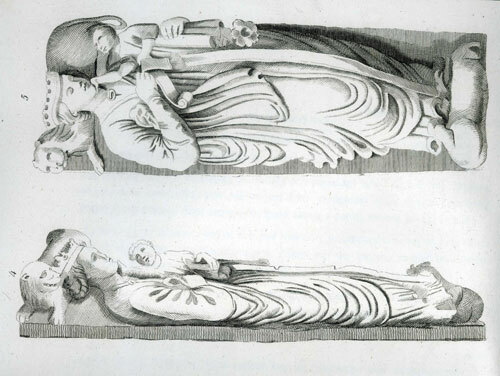 Lombardic lettering can be difficult to date stylistically and there is no heraldry to help us identify the mother and her child or date the tomb. 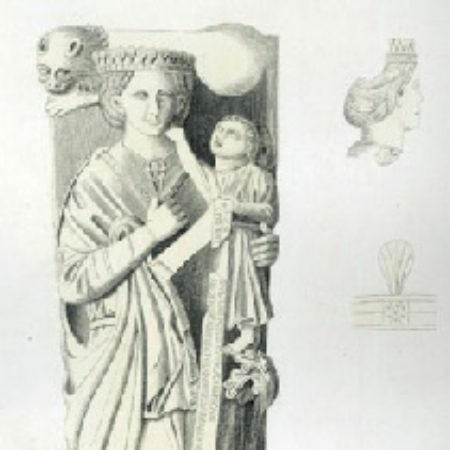 Nikolaus Pevsner ignored the tomb in his 1953 Derbyshire volume, but the 1979 edition describes it as a ‘beautiful C13 effigy of a woman (probably Constantia de Frecheville † 1175)’. 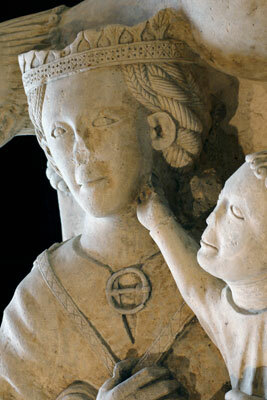 Constantia is an unusual name at this time, but the reputed link with the de Frecheville family cannot be substantiated nor her death in 1175. 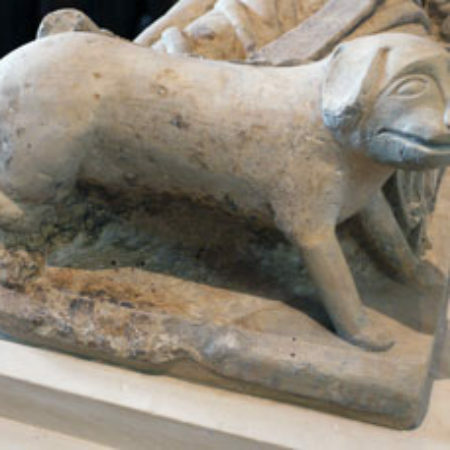 Stothard dated the monument as thirteenth-century, yet Harry Tummers excluded it from his 1980 study Early secular effigies in England: the thirteenth century. Other scholars have dated it to the fourteenth century, including Arthur Gardner and the jewellery expert Richard Lightbown. In 1710 the Derby herald-painter and antiquary Francis Bassano (1675-1746) recorded an intriguing local legend of how Lady Constantia was pregnant when she found herself lost in the nearby forest. The sound of Scarcliffe’s church bells guided her to safety and she was delivered of a son. In gratitude she ordered a piece of land – varying in size from two to four or five acres in accounts from 1682 on – to be given to the church for the maintenance of the bell ropes and for ringing curfew in perpetuity. A wooden board painted in 1832 records this bequest. The story ends sadly: mother and child both died – in the year 1000, according to Bassano. The story reads like a folk tale. 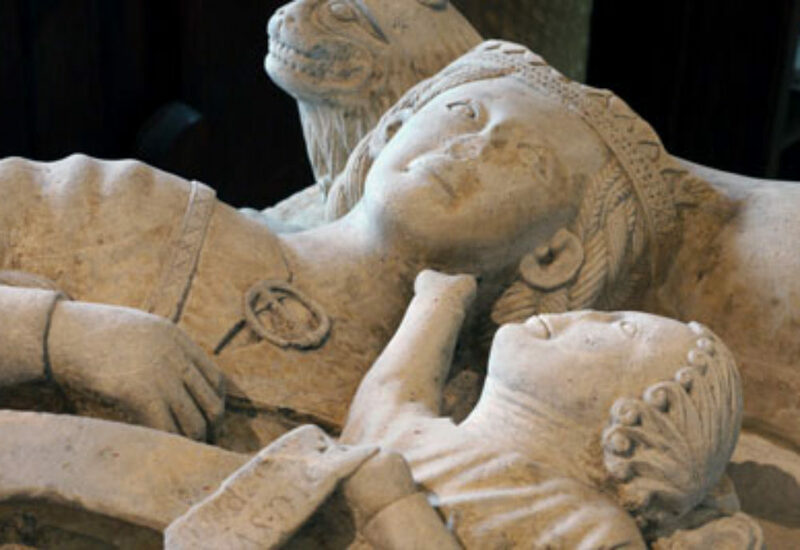 Yet despite the absence of contemporary records relating to a lady named Constantia, a new church guide proposes a twelfth-century date for Scarcliffe’s grand monument. 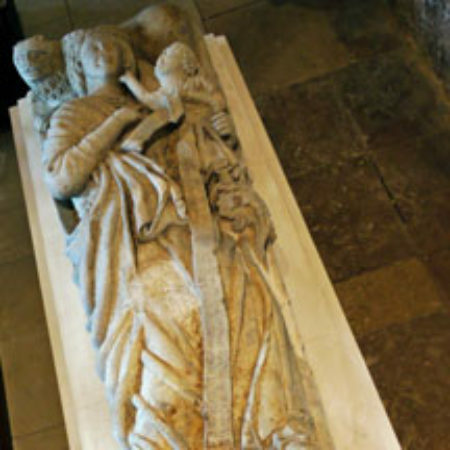 It also claims rather fancifully that the woman commemorated is Constance ‘FitzHenry’, illegitimate daughter of King Henry I by one of his many mistresses, and ultimately the 23rd grandmother of the late Diana, Princess of Wales. A previously unrecognised royal memorial in a village church in rural Derbyshire reads like a fairy-tale and probably is just that. 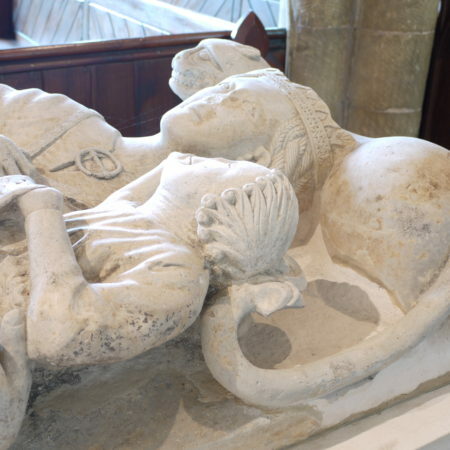 The monument that we see in Scarcliffe today is unlikely to date from the twelfth century, before the period when effigies to the laity are known in England. 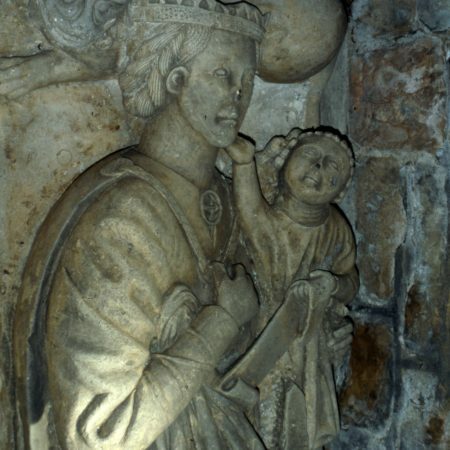 In fact, it is probably not medieval at all: its condition is too good for such an early date, various aspects suggest different dates, and the iconography suggests heavy borrowing from typical medieval sculpture – most notably the Madonna and Child – in order to create a medieval pastiche. Crucial is the account of 1710 by Bassano, who recorded the moment as being ‘fine but very Antient’ and described the crown or coronet as ‘mostly broken off’. More importantly, he added that he ‘could not Read ye Scroyle’. 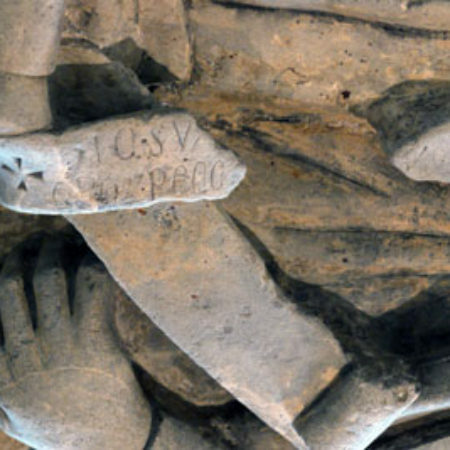 This is curious, for even in the present broken state of the banderole the inscription is not difficult to read and certainly should not have been so for an antiquary. However, did Bassano describe the same monument that we still see in the church today, or was he looking at an earlier monument than the one we see today? 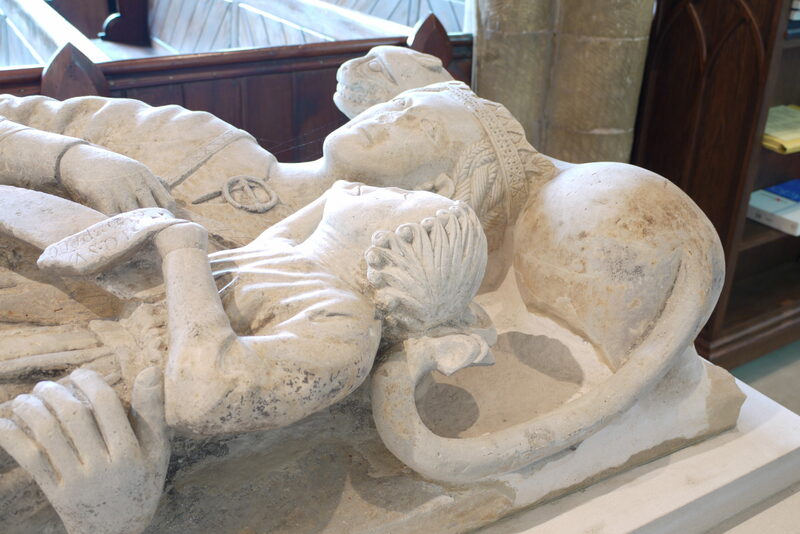 There may well have been a medieval monument at Scarcliffe that inspired a local legend but became so battered over time that a replacement was needed to keep the tale alive. 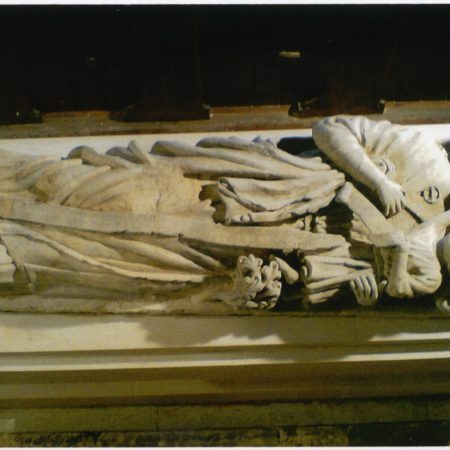 A similar case is the so-called ‘Stanley boy’ effigy in Elford (Staffordshire), a ‘restored’ miniature effigy that was described here as the Monument of the Month for February 2010. Alternatively the monument may have been created specifically to lend substance to an earlier local legend. 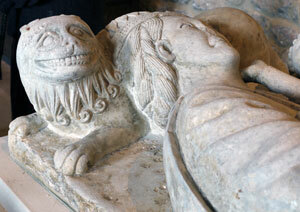 Either way, we probably have here not a grand medieval tomb, but a post-medieval forgery by an unknown sculptor. ● Sophie Oosterwijk, ‘“A swithe feire graue”. 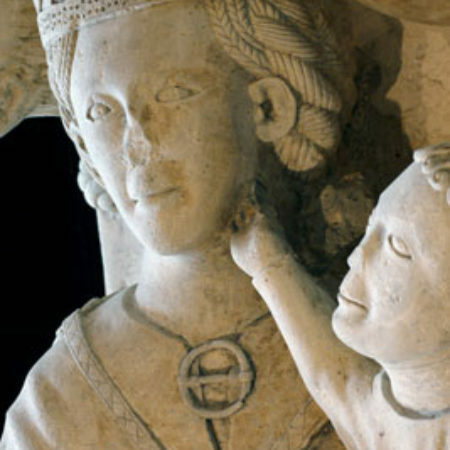 The appearance of children on medieval tomb monuments’, in Richard Eales and Shaun Tyas (eds), Family and dynasty in the Middle Ages (1997 Harlaxton Symposium Proceedings) Harlaxton Medieval Studies, 9 (Donington: Shaun Tyas, 2003), 172-92. 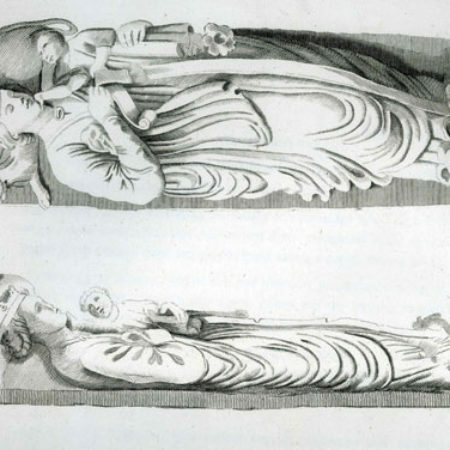 ● Sophie Oosterwijk, ‘Madonnas, mothers, mites, and the macabre: three examples of medieval mother-and-child tomb iconography’, Church Monuments, 18 (2003), 10-22. ● Sophie Oosterwijk, ‘Deceptive appearances. 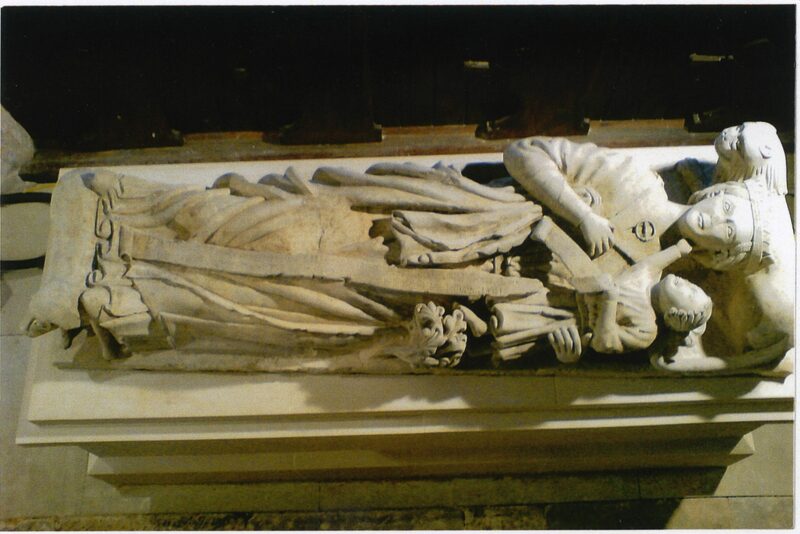 The presentation of children on medieval tombs’, Ecclesiology Today, 42 (2010 – theme issue on church monuments edited by Sally Badham), 43-58. ● Trevor Skirrey, ‘The legendary Lady Constantia of Scarcliffe’ (Tony Bell, 2008), ISBN 978-0-9537775-2-5.